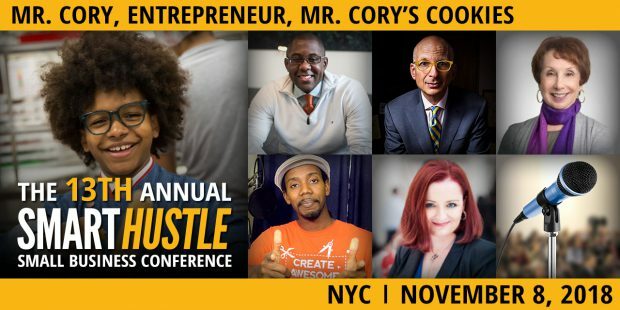 We are proud to announce the return of the 13th Annual Smart Hustle Small Business Conference. This year, we will be hosting amazing speakers including the owners of Mr. Cory’s Cookies, Mr. Cory and Cookie Mom! Mr. Cory's Cookies is a NJ based company founded by 6 year old Cory Nieves, aka Mr. Cory. He started the company as a way to help his mom purchase a car. Like millions of other viewers, I first watched this story on CNBC's The Profit and had the pleasure of recently interviewing Mr. Cory and his mom Lisa "Cookie Mom". Ramon: Mr. Cory, why don’t you give us an overview of your business and why you started it? Mr. Cory: I started Mr. Cory’s Cookies because I wanted to help my mom, so she could afford a car. We started selling hot chocolate and lemonade, then moved to cookies because everyone loved our cookies. We became an official business after we got shut down because we weren’t an official company. Step by step, we grew. People posted our cookies on Instagram, Ellen DeGeneres saw us, and we were recently featured on The Profit where he [Marcus Lemonis] helped us sell our cookies online. Our main goal at Mr. Cory’s Cookies is to spread love one cookie at a time. Q: What is the biggest reasons for your success today? Mr. Cory: We didn’t give up, and we believed in ourselves. Getting the investment from Marcus Lemonis also helped us and gave us the capital we needed to boost our company. Cookie Mom: There’s a lot of different things that brought us to the verge of being successful.We still have a long way to go to reach success. This business is a single mom-and-son duo, so people relate to what’s really going on. They see that somebody can come from a bad situation and turn it into a positive. It’s a story that people buy into and that is what sets us apart from major cookie companies in the world. I feel like our story connects and resonates with so many people. Q: As you think about the future of your company, what are some of the challenges you’re keeping your eye on? Cookie Mom: It’s not even about five to ten years from now, its about right now. The problems only escalate as you get more money. But one problem is finding employees. It is so hard to find people who genuinely want to work for the company and build something with you. Everybody just wants to make a quick buck and live happily. Also you have to keep up with the Joneses. You have to keep up with what’s new. You have to do whatever it is -advertising, social media- to keep yourselves out there continuously. It is extremely difficult to keep the integrity of your business while making money. Investment is good but once you have the money, it gets harder to please others and maintain the integrity of your business. Q: Mr. Cory, you’re a young man. How do you deal with your relationship with your mom, as a CEO, and working with your peers. What advice do you have for other young entrepreneurs, and how do you find balance between being a young man and being a CEO? Mr. Cory: You need to learn how to keep your kid-like nature out of the room. You have to learn how to control your kid life, and put a business face on. Sometimes, you would rather be playing Fortnite during a meeting, but it is important to be serious and focus on notes. Q: What are the roles that you and Cookie Mom have? What do you oversee and what does your mom oversee? Mr. Cory: My mom mostly handles the marketing/advertising and testing new flavors. Cookie Mom: Cory is the one who goes out and sells cookies, engages with customers, and connects on social media.He is the face of the company. Q: What are some tips you have for other business owners to market and reach out to morecustomers? Mr. Cory:You have to find out who you want to reach out to-who your market is. If you’re reaching out to younger people, I recommend Instagram so you can post photos or videos. If you have YouTube, you could use YouTube ads or reach out for more subscribers. Cookie Mom: If you’re out posting pictures, you can’t post boring pics. Think about what other people would like to see, look at what interests those around you and work to gain the attention of all people. Q: Do you have someone on your team who works your social media. Cookie Mom: I used to do this on my own, but now we have a more experienced social media team. Mr. Cory: Just smile. Even when you’re dealing with a meany, keep smiling and maybe bring along some cookies. Cookie Mom: Don’t become an entrepreneur just for the hype that you see on social media. Whatever you come up with should be a need and not a want. You need to understand that you’re not going to be rich tomorrow. You can’t treat your business as a job, treat it as if you’re building something for a better future for others.